September 15, 2015: TechGig Code Gladiators 2015 has been India’s largest coding contest and entered in the Limca Book of Records. TechGig Code Gladiators (TGCG) is an annual national-level coding contest, organized by Times Business Solutions – a division of Times Internet Ltd. The 2015 Edition of TechGig Code Gladiators was a grueling two-month contest to find the best coder in the country. 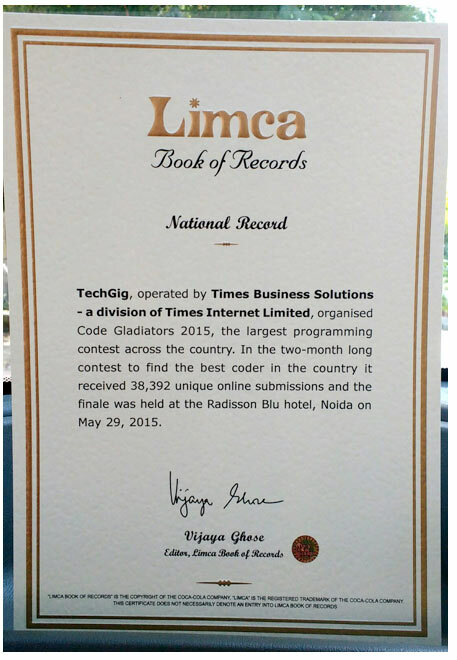 The National Record Certificate conferred by Ms. Vijaya Ghose, Editor, Limca Book of Records states, "TechGig operated by Times Business Solutions – a division of Times Internet Limited, organised Code Gladiators 2015, the largest programming contest across the country. it received 38,392 unique online submissions and the finale was held at Radisson Blu hotel, Noida on May 29, 2015." Over 80,000 coders from across 9,000 top IT companies coded in Java, C, C++, C#, VB.net, Java Script, Python, Perl, Ruby and PHP in online rounds that culminated in the top 125 coders meeting in person to battle it out face-to-face. “The recognition of TechGig’s achievement as a National Record in the Limca Book of Records substantiates our belief of having created the most valuable, meaningful and world-class IT community. We dedicate this achievement to all our TechGig members who participate, contribute and benchmark their skills against the best in their class on our platform. Going by the sheer size, scale and level of competition, TechGig Code Gladiators 2015 was unique not just in India but probably the world. And now it’s official. We look forward to making it even bigger and better in the next edition.” says Vivek Madhukar, COO, Times Business Solutions. TechGig is a pioneer in benchmarking the best programmers and the best IT companies across India – through technology-related competitions for internal employees, company-sponsored contests for talent engagement and various employer-branding activities. Code Gladiators combines all these initiatives and takes the scale to a whole new level – where employees from different companies across India are competing in the contest at the same time. Code Gladiators is a corporate battle – the best talent from IT companies battle it out in a fight to the finish. This national-level competition showcases the company with the best coders and identifies the best coder in the country. This year’s grueling competition saw the rise of top five coders, top five IT companies and a top Code Diva from among thousands of participants. Mr. Devender Malhotra, Vice President & Chief Quality Officer- Wipro Limited congratulated TechGig Code Gladiators for becoming the "IPL of the IT World" while congratulating the winners, he stressed on the importance of multiskilling in the hypercompetitive world of coding. The companies whose employees scored the highest at Code Gladiators 2015 were led by Persistent Systems, who won the ‘India’s Coding Power House’ award for the second year running, followed by Steria (second), IRIS Software Pvt. Ltd. (third), ITC Infotech (fourth) and Amadeus South Asia (fifth). TechGig.com is a culmination of everything related to technology, a platform exclusively for IT professionals to synergize, share, exchange ideas, facts and information as well as showcase their work and express their views on the vast repertoire that the IT industry encompasses. Garnering cutting edge technologies, views, reviews and news, jobs as well as providing a podium for connecting with your colleagues, peers are the mainstay of TechGig.com. The TechGig network is operated by Times Business Solutions – a Division of Times Internet Ltd.